Built your own responsive affiliate ecommerce store with our all in one readymade solution for Affiliate Ecommerce Website. As it is the trending business in the online stores entrepreneurs have bright opportunity to utilize affiliate marketing system. Affiliate MLM program has basically intent to manage affiliate partner, tracking referrals, commission payout and more. Upon utilizing our enhanced feature website to improve your sales rate and recurring referral bonus. Fully dynamic management system and easy to handle work around. On signup with Open Source Affiliate Marketing Script user can create profile details with valid credentials. In the profile section set billing and shipping address. Through search filter get desired results as per the search query or view the products listed in the category. Each products contains respective title, description and featured images. If you are interested to purchase the product, add to the cart. As well as provide the star rating to the products which you deserve. In some cases provide the review of your view about the ecommerce products. User can have referral coupon to buy the products once the product is purchased, referred member can have referral bonus. In PHP Affiliate Network Script, all transactions are undergone through a secured transactions such as direct bank transfer, cheque payment and PayPal, visa, master card as convenient to the purchaser. Intent customer can register to the blog news and newsletter for further updates. Through admin panel one can easily add products affiliate link, product description and images etc. Admin management topographies are category and sub category, blog news, posted products coupons, referral bonus, order management, user roles, user feedback control, etc. Admin can take reports of ordered products, ordered customers and stock details by week, month and year. By using the latest Google trends and algorithm updates, our script is well optimized for search engine friendly. Increasing the sale force is the highest motive in the ecommerce website, our responsive design and user friendly structure tends to benefit more. As flexible customizable ecommerce affiliate script process with a various level of department category of services holds accuracy in work of maintaining the easy flow of database. In which the upcoming requirement from you if needed are done effectively through an open source php code. 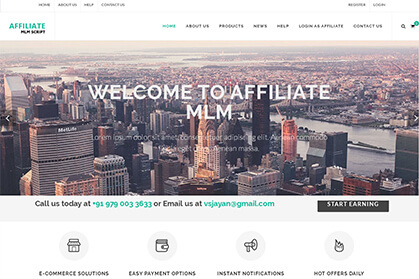 Get 1 year of technical support and 6 month code update on purchasing our MLM ecommerce script. The customer support has been great so far. We had a few easy going issues at first, but nothing out of the norm. Look forward working with these guys and continuing to provide a great experience. This script is simply superb with all new features. The team is very helpful and answered all the questions quickly. The guys made a great work. Thank you so much, you made my business very easy without any complications in purchasing and installing the software. Extraordinary technical support, great documentation method, well designed website templates Blossom!! !